The first Cochrane review of the research relating to the administration of anti-D during pregnancy was undertaken in 1996. “Two average to poor-quality trials, involving over 4500 women, compared anti-D prophylaxis with no treatment. When women received anti-D at 28 and 34 weeks’ gestation, relative risk (RR) of immunisation during pregnancy was 0.42 (95% confidence interval (CI) 0.15 to 1.17); after the birth of a Rh-positive infant the RR was 0.42 (95% CI 0.15 to 1.17); and within 12 months after birth of a Rh-positive infant the RR was 0.41 (95% CI 0.16 to 1.04). While none of these differences were statistically significant, the risk difference (RD) between anti-D and no treatment was significant (RD -0.01, 95% CI -0.01 to 0.00) suggesting reduced incidence of immunisation after anti-D prophylaxis.
. (4) we haven’t carried out much work looking into the potential risks and side effects of anti-D to the mother and her current baby, neither of whom directly benefit from its administration or, indeed, explored the wider issues and ramifications of this more fully. In practice, and despite these factors, most Western systems of maternity care have at some point in the past couple of decades adopted the practice of offering (and, as ever, I use this term loosly but insistently, because we have to model what we want to see even if it isn’t the current reality) antenatal anti-D to the rhesus negative pregnant women who are accessing mainstream maternity services. Not all of these women want it, of course, but many do. I have lectured widely on this topic and this has led me to understand that in some areas, including much of the UK, many of the people offering antenatal anti-D to women would love to be able to explain the ins and outs of this issue but don’t feel able to do so, generally because they don’t have the time and/or the confidence to go against the party line. And yet, as the authors’ conclusions from the latest review shows, we still don’t have good evidence that this intervention is effective or helpful and many concerns and questions remain. Existing studies do not provide conclusive evidence that the use of anti-D during pregnancy benefits either mother or baby in terms of incidence of Rhesus D alloimmunisation during the pregnancy or postpartum, or the incidence of neonatal morbidity (jaundice) (low to very low quality evidence). However women receiving anti-D may be less likely to register a positive Kleihauer test in pregnancy and at the birth of a Rh-positive infant (low quality evidence). Fewer women who receive anti-D during pregnancy may have Rhesus D antibodies in a subsequent pregnancy, with benefits for the baby, however this needs to be tested in studies of robust design. Does antenatal anti-D help the current baby? and a whole series on anti-D (focused mainly around postnatal administration) which starts here. Finally, here’s the link to the latest version of the Cochrane review if you’d like to read it in full. Hello! I am a bit late, but as the topic remains important, I would like to add two aspects. The first is regarding another issue around the human immunoglobulins used for Anti-D injections. They are extremely expensive and are becoming difficult to get. Therefore any efforts to reduce the need for its generalized use, would be helpful. Secondly, and independent from whether it is effective or not, it is in the meantime possible to figure out the unborn babies bloodtype from maternal blood. We can therefore know whether a woman would be at risk of immunisation at all, which is not the case, if the baby appears to be rhesus negative as well. In the Netherlands, it is now common practise to check for the fetal rhesus factor and only administer antenatal Anti-D if the fetus is rhesus-positive. This said, I would agree that more research is needed considering the many unclear aspects of general antenatal immunisation. Very useful blog. 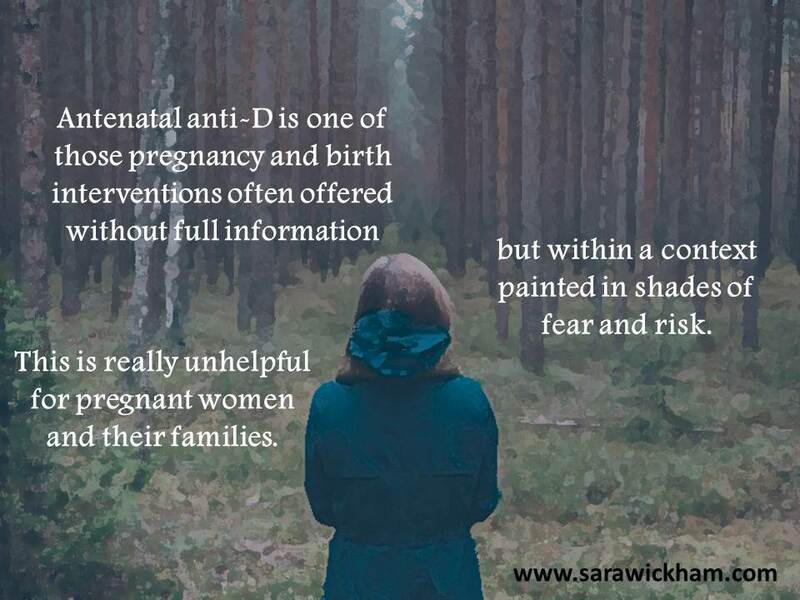 I wish I had read 2 weeks ago, I was given anti d at 29 weeks pregnant, I was reluctant but went along with it after persuasion from midwives and not finding any internet evidence against the injection (until now). The day after the injection I woke up with a sore throat which quickly developed into bronchitis! I am a very healthy person and never get ill so this was definitely triggered by anti d. Don’t know what to do in future pregnancies when I am offered (forced into!) having anti d again?